* Hawaiians received a false alarm on Saturday warning of an inbound ballistic missile and causing instant, widespread panic. 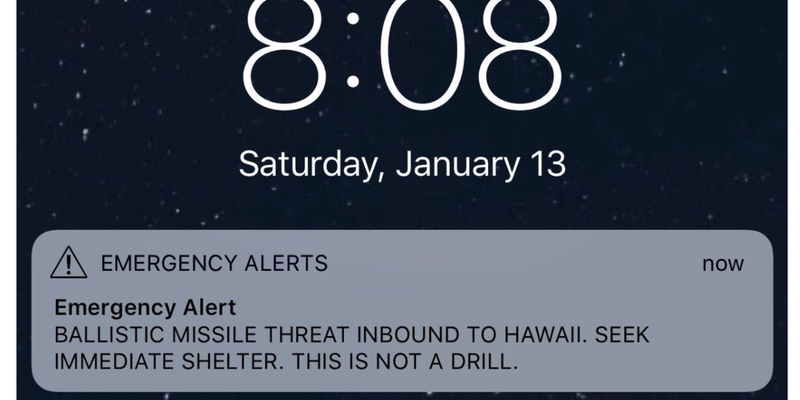 * The alert was apparently caused by an employee at Hawaii's Emergency Management Agency pushing the "wrong button" by accident. 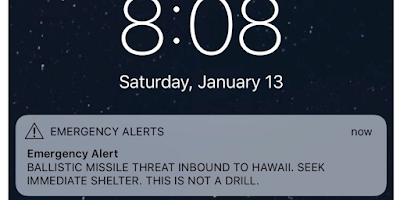 * A second alert clarifying that there was no missile threat to Hawaii did not come until 38 minutes after the initial false alarm. Residents and vacationers in Hawaii awoke Saturday morning to a stunning emergency alert blaring across the screens of their smartphones: "BALLISTIC MISSILE THREAT INBOUND TO HAWAII. SEEK IMMEDIATE SHELTER. THIS IS NOT A DRILL." There was no missile. The alert was a false alarm, Hawaii's US senators said on Twitter as they rushed to tamp down the hysteria that ensued. The alert was sent out when an employee mistakenly pressed the "wrong button" during a shift change at Hawaii's Emergency Management Agency, Hawaii Gov. David Ige later said. WNU Editor: As I remarked in my post on this story yesterday, I know exactly how these people felt in Hawaii when the alert was broadcast .... Panic In Hawaii After A False Alarm Of Incoming Ballistics Missiles Was Issued To People's Cell Phones (January 13, 2018). Update: This article is spot on .... Pandemonium and Rage in Hawaii (Alia Wong, The Atlantic).